Karma is action. The law of Karma operates to bring about rewards as well as punishment. The man who is now enjoying a life of ease and wealth has obtained it through Karma; the sage who has attained to great knowledge and power reached them through Karma; the disciple drinking the bitter drops from the cup of failure mixed the draught himself through Karma; Buddha’s great disciple Magallana—greater than any other—was suddenly killed, apparently in the height of his usefulness, by robbers: it was Karma; the happy mother seeing all her children respected and virtuous dies the favorite of Karma, while her miserable sister living a life of shame in the same city curses God by her life because she knows not that it is Karma. The world itself rolls on in its orbit, carried further and further with the sun in his greater orbit, and grows old through the cycles, changes its appearance, and comes under laws and states of matter undreamed of by us: it is the Karma of the world; soon or late, even while revolving in its orbit, it will slowly move its poles and carry the cold band of ice to where now are summer scenes,—the Karma of the world and its inhabitants. I do not think so. These beautiful things belong to a lower plane and are seen by several senses and departments of senses. Many different causes might have produced them. Today you might see the face of a woman or a child whom you will not meet for the next ten years and have never yet seen; or a long-forgotten and slightly-noticed object in the past of the present life may be suddenly opened to clairvoyant sight; again, there may be deeply laid in your nature mental deposits from long past lives, and these may tinge your visions. I cannot answer individual cases; such is the work of a vulgar fortune teller. Each one must with patience study his own experience through many years, carefully noting and verifying and eliminating as time goes on. Each person who has clairvoyance has his or her own special phase—and there are millions of phases; hence five separate clairvoyants may see five different pictures or symbols, all produced by one and the same cause; or four of them may see four different pictures while the fifth sees the result of a combination of his own with the other four phases. The world is so old that man’s acts and thoughts for many millions of years have stamped the Astral Light full of pictures. But the Astral Light itself has cycles, tides, and changes, so those must be allowed for; it is useless to try to explain this, but in the changing of the cycles the symbols sometimes are mixed and interblended. When a class of elementals is fully developed and ready to run its appointed course from the beginning of an Age, there is a symbol for it that can be used until the complete decadence or extinction of that class, but at the change of certain cycles the symbol ceases to have power because that to which it once applied has altered and we know not the new symbol. You ask to know more about these symbols? It is not useful or necessary. Now No. 1 is ending within No. 2. Call the beginning of No. 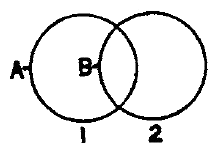 2 at B, and it is seen that it had its inception while No. I was finishing. The real point of ending for one and commencement for the other is probably at a point found by drawing a line through where the circles touch at top and bottom, and let the spaces on either side of that line be called the dawn and twilight. It has been well said by H. P. Blavatsky that “each one has a potential black magician within.” The black magician is the fruit and perfection of selfishness; selfishness is the triumph of the lower nature. The black magician is the opposite pale in human development to the white Adept, and the latter is the fruit and perfection of the highest qualities in man contained with entire communion with spirit; this is the triumph of all that is best in the human being; it is the conscious union with the divine. The black magician stands far self alone, and therefore for discard, separation, and destruction; the white one is the embodiment of union, harmony, and love. In the words of Bhagavad-Gita the white adept “is the perfection of spiritual cultivation,” and it must follow that the black one is the perfection of material cultivation. In this question, “black” represents self and “white” the spiritual whole. The query then arises, “Why are there now only white magicians and merely embryo black ones?” We think there are but few black adepts existing today, but of the white school there are many. The age and the cycle have not yet came to that point where the black magician has blossomed, and it is easy to understand why there are perfect white ones. The question is answered in Bhagavad-Gita where it says, “At the night of Brahma the Jivanmuktas are not absorbed nor destroyed, but all others are; and at the coming forth of the new creation those Jivanmuktas (white adepts) came forth intact and conscious.” 1 This means that at the preceding pralaya—or dissolution—all the black adepts were destroyed; and as now but the first 5,000 years of Kali Yuga have elapsed, there has not yet been time to evolve enough full black magicians to make a sensible impression upon us. The first part of the question, therefore,—”How are we to treat a black magician”—is premature. Further than this, some of these devoted students have been reading such works upon practical yoga—or Hatha Yoga— as they could procure, and trying to follow the rules laid down, notwithstanding the distinct caution in all such books that the practices should not be pursued by the student unless he has a competent guide and teacher to help and protect him on the way. Now as there are no such guides in the United States—but all here being alike mere tyros, students, or probationers—it is evident that the very first rules have been violated. We answer by saying that the sincere study of the philosophy and rules of Patanjali’s Yoga System may be taken up by any theosophist—on one condition. That is that he shall, as a theosophist, try to carry out the fundamental object of the Society—Universal Brotherhood. In no other way can he receive assistance from any source. Altruism must be made the aim of life, or all practices are absolutely void of lasting effect. We do not speak from a mere theory but from experience; nor do we claim to have perfected altruism in ourselves, but only that, as far as possible, we are trying to make altruism the rule of life. This may be stoutly denied, but what matters it? The fact remains patent to all that among western people there are few persons masters of any part of occult practice. Partial concentration of mind, even—the first step for any practical use of the recondite laws of nature—is conspicuously absent from our people. Altruism has been for so many centuries a dead letter, and individualism has been so much cultivated, that the soil has become almost barren. Western peoples are not even fitted to attain perfection in Black Magic, which is supposed to be easy to pursue, though in fact not so; but we are able to lay the seeds in this incarnation far further development upon the evil side of our nature in future lives. The practice of altruism as far as we can is the only way in which to avoid suffering in the future. Those aspirants far wham these wards are written have been laboring under a mistake. They have entered a society formed by Beings in whose existence they profess belief, and have not acted upon the instructions given, but have selected such portion of those as suited them. The Adepts have distinctly said that occult powers can be obtained, but They have also said that the Society, which has Their protection and assistance, is not for occult development, and that the latter cannot be forwarded by Them unless members will preach, teach, and practice Altruism. There is therefore no sort of obligation upon either, the Adepts, or the disciples who do know, to help members whose chief aim is occult development. We must deserve before we can desire. While we are endeavoring to understand and practice altruism, and while spreading broadcast the doctrines given out by the Adepts’ respecting man, his status, future fate, and right way of living, each theosophist can devote some of his time to daily meditation and concentration, and all of his time to extirpating his faults and vices; when he has made some progress in this, the good karma he may have acquired by working for the cause of Humanity, which is the same as Universal Brotherhood, will help him to get ready to begin occult practices. It is supposed by some that initiation is always and in every case a set and solemn occasion for which the candidate is prepared and notified of in advance. While there are same initiations surrounded by such solemnities as these, the daily one, without success in which no aspirant will ever have the chance to try for those that are higher, comes to the disciple with almost each moment. It is met in our relations with our fellows, and in the effects upon us of all the circumstances of life. And if we fail in these, we never get to the point where greater ones are offered. If we cannot bear momentary defeat, or if a chance word that strikes our self-love finds us unprepared, or if we give way to the desire to harshly judge others, or if we remain in ignorance of same of our most apparent faults, we do not build up that knowledge and strength imperatively demanded from whatever is to be master of nature. It is in the life of every one to have a moment of choice, but that moment is not set for any particular day. It is the sum total of all days; and it may be put off until the day of death, and then it is beyond our power, for the choice has then been fixed by all the acts and thoughts of the lifetime. We are self-doomed at that hour to just the sort of life, body, environment, and tendencies which will best carry out our karma. This is a thing solemn enough, and one that makes the “daily initiation” of the very greatest importance to each earnest student. But all of this has been said before, and it is a pity that students persist in ignoring the god advice they receive. Do you think that if a Master accepted you He would put you to same strange test? No, He would not, but simply permitting the small events of your life to have their course, the result would determine your standing. It may be a child’s school, but it takes a man to go through it.